Mendes Training & Consulting, Inc. Since 1988, Dr. Ernie Mendes has helped tens of thousands of teachers engage their students, increase achievement, and improve behavior. 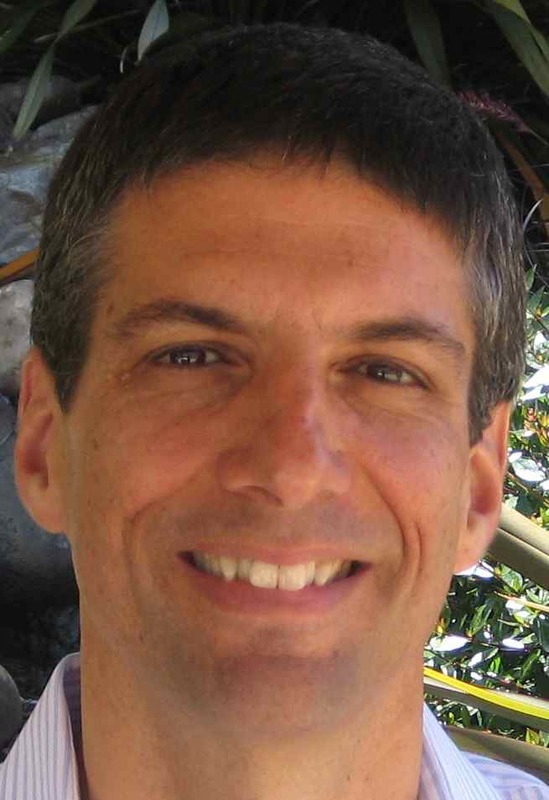 He has assisted leaders in building effective teams, and managing challenging personalities. Through his keynotes, trainings, books, and coaching, Ernie has helped individuals become more productive and satisfied with their work and their relationships. FREE SHIPPING on all orders shipped to U.S. destinations! AND sales tax is included in the price! For years, teachers at my workshops have been asking me, Is there a book with all of these strategies you’re teaching? Well the answer is finally YES. This is it. Just released in August, 2010. The ideas in this book have been expressed in my trainings over the years. They are active learning strategies that can be used across all grade and developmental levels. They are based in brain research, engagement research, and include the newer wave of mind-body science. In my consulting work, I’ve seen these strategies and ideas successfully implemented in classrooms to increase student engagement, boost recall of content, and generate understanding in diverse groups of learners. My belief is that good engagement is also classroom management. With a growing use of technology in the classroom, the ideas in this book are more needed than ever. These ideas engage and provide an active human connection. 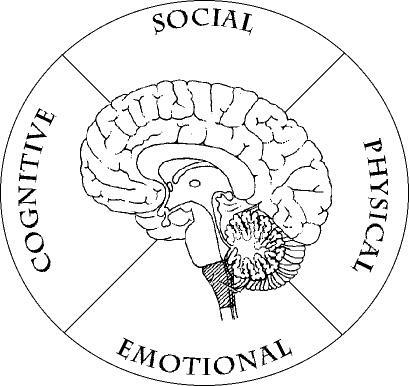 Learning is social, emotional, cognitive, and physical. 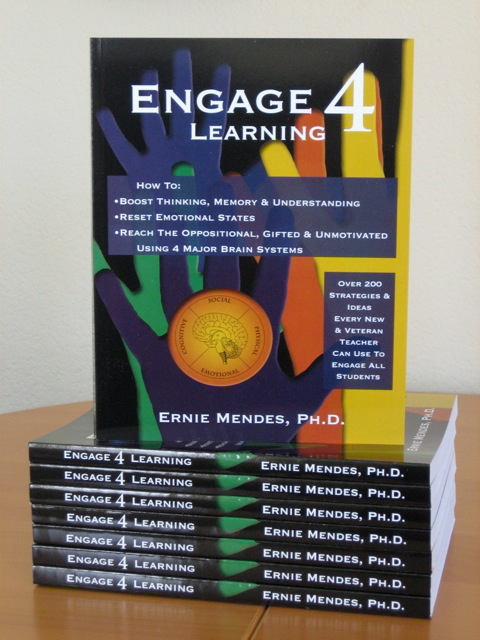 This book combines Brain Research and Emotional Intelligence theory. 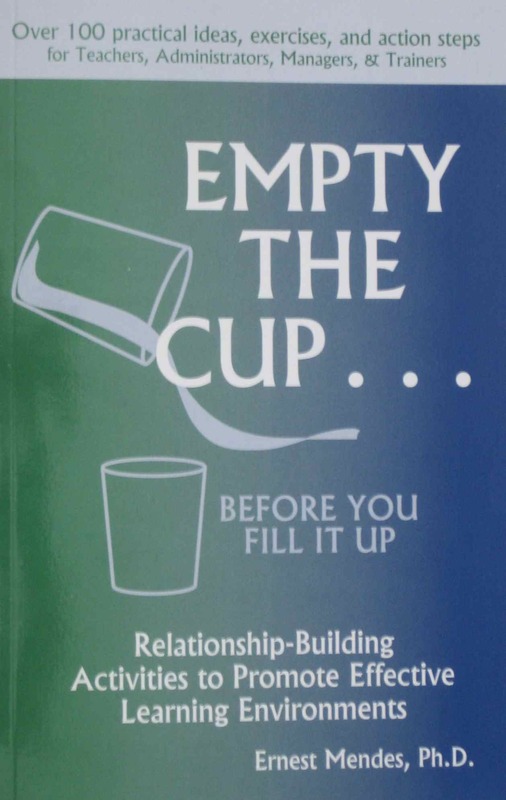 Empty the Cup theory is about creating mental and emotional space for learning. In the classroom students bring in full cups from home or recess. They are less than ready to learn. These cups contain prior knowledge of the current topic being studied; an upset from something a friend or parent said to them before arriving to your classroom; their excitement about the new video game that is coming out today; etc.Your cup is full too with concerns and emotions and the content standards you are planning on teaching. As you pour the content of your knowledge into their full cups what happens? Well you get an overflow which ends up on the floor, but not in their cup. So what to do? Learn ways to empty their cups before you fill them with your lessons. Create some mental and emotional space for learning! If you purchase both books at the same time, you will receive a combo pricing discount! Copyright 2012 Mendes Training & Consulting, Inc.